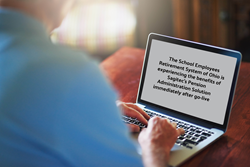 The School Employees Retirement System of Ohio's new pension administration solution, which was developed by Sagitec Solutions, has drastically improved business processes and customer service. “We value Sagitec as our strategic partner and we look forward to having a long-term relationship with Sagitec,” said Jay Patel, Chief Technology Officer and Project Manager for the SMART project. “Our primary goal was to improve customer service and update our processes, and the new SMART system does both,” said Ninos. The decisive moment when SERS’ staff realized the capabilities of SMART in streamlining business processes occurred in May when the agency was able to process more than 1,200 retirement applications in one month, which is the most the agency has ever been able to process in that amount of time. “I was pleasantly surprised at the amount of retirement applications that our staff was able to process,” said John Grumney, Director of Member Services and Project Manager for the SMART project. “That is definitely something we weren’t able to do in our previous system,” added Grumney. One reason for the increased speed and efficiency in retirement application processing is due to the fact that the SMART system performs all of the required calculations accurately, which is something SERS’ legacy system could not do. Besides improving the completion of retirement applications, the SMART system features numerous enhancements to the member and employer web self-service portals, and new features such as digital workflow management and paperless processing. “Specifically, the web self-service portals help promote the agency’s goal of superior customer service while also drastically improving data quality,” said Chris Castle, Employer Service Manager. Castle, who was instrumental in designing the SMART system with Sagitec staff, is appreciative of the employer web portal improvements, especially those associated with employer reporting. SMART’s functionality and features are not the only attributing factors to the modernization project’s immediate successes – it was also a strong partnership and deep commitment to the project by both Sagitec and SERS that resulted in a positive go live transition. “I think that it was almost like we were operating of one mind and there was a real commitment to the things that needed to get done,” said Ninos. Sanjay Gupte, Sagitec’s project manager for the modernization project, echoes Ninos’ sentiment. While Sagitec has officially finished developing the SMART system, that doesn’t mean the relationship between SERS and Sagitec has ended. “We value Sagitec as our strategic partner and we look forward to having a long-term relationship with Sagitec,” said Jay Patel, Chief Technology Officer and Project Manager for the SMART project. Sagitec Solutions, LLC designs and delivers tailor-made pension, provident fund, unemployment insurance, and healthcare and life sciences software solutions to clients of all sizes. Understanding that a dynamic world requires dynamic technology, Sagitec offers solutions that are highly configurable and extensible by nature. With deep industry experience in software implementation and systems integration, project management, consulting, hosting and software support, Sagitec is a partner clients can trust to deliver mission-critical IT projects. Find further information by visiting http://www.Sagitec.com or by contacting Rick Deshler at (651) 335-3406 or at Rick.deshler@sagitec.com.